Preheat oven to 350°F. Line a baking sheet with parchment sheet. In small bowl, stir together the apples, brown sugar, flour and salt until well combined. Set aside. On a cutting board, cut the pie crust (with a t-shaped cut) into four pieces. Divide the cheddar cheese evenly among the four pieces (in the center). Top each with 1/4 of the apple mixture. Fold each pie crust over the filling. Press the edges with your fingers to seal, and then use a fork to press again along the edges. Transfer to the prepared baking sheet. Pierce each of the pastries with a knife four times (for ventilation). Brush the turnovers with egg white and sprinkle liberally with the course sugar. Slide the baking sheet into the oven and bake for 25-30 minutes, until golden brown. Let cool slightly before serving. Apples and cheddar are one of those flavor pairings that's a little unexpected, but oh-so-good. From grilled cheese sandwiches with a spread of apple butter to apple pie with cheddar on top (a favorite, I hear, among some of my Wisconsin-bred colleagues' families), it works. Of course, if you've never had cheddar and apples together, you are probably skeptical. I can't blame you. They sure don't sound like a match in heaven, right? Apples are sweet and cheddar is sharp. Apples are juicy and cheddar can be oily. I hear you, but I have to tell you -- put aside your preconceived notions and give this fabulous pairing a chance. It's worth it. 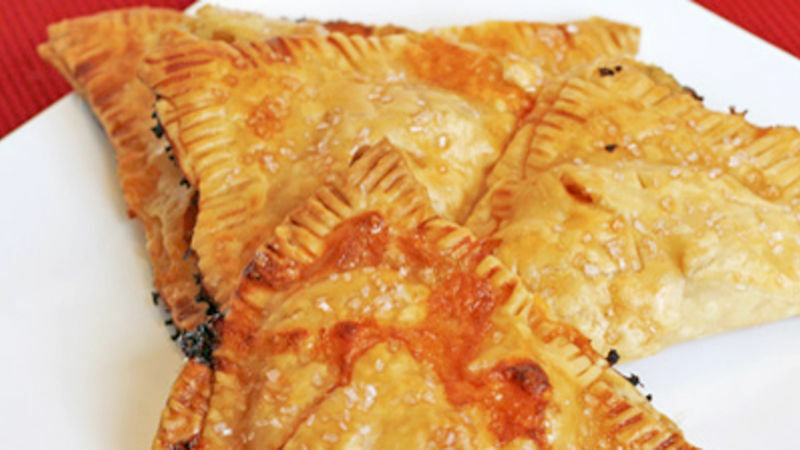 And if you are going to try it, try it in these Apple and Cheddar Turnovers. They are a prime example of how these two flavors can compliment each other in a really sophisticated way. The cheddar melts and becomes one with the crust, weaving it's sharp flavor throughout. When you bit in, you get that sharp, crisp crust and the sweet, soft apples inside. It's heavenly. As far as desserts go, this one is pretty fast and simple to make. Just toss the apples with a little sugar and flour, layer the cheddar and apple mixture in 1/4 of a pie crust, fold, seal and bake (ok, there might be one or two steps more, but they are super fast too). For the crust, I use Pillsbury Pie Crust, which is perfect right out of the fridge. The egg wash before baking and sprinkling of course sugar is an absolute must. It finishes off the whole dish beautifully. What unusual flavor combination do you love?